Microsoft SQL Server 2017 Standard Edition 32 Core License. This is the Per-Core License, supporting servers with up to 32 Physical Cores. Per-Core licenses comes with unlimited User CALs. Language: US- English, license is good worldwide. Experience breakthrough performance with SQL Server 2017 features. SQL Server 2017 is the biggest leap forward in Microsoft data platform history with features that increase performance, simplify management, and transform your data into actionable insightsall on a database that has the least vulnerabilities of any major platform. Some of the new capabilities of SQL Server 2017. · Build intelligent, mission-critical applications. · Break free from Oracle. · And much much more. Check on the Internet, it has hours of reading about SQL Server 2017. Automatic Tuning: While many database vendors have claimed to have self -tuning databases in the past, Microsoft has built intelligence into a set of self-tuning features in SQL Server 2017. Microsoft has learned a lot from supporting Azure SQL Database and identifying customer performance problems. Running a database service that services millions of databases allows for deeper insight into how customers use the product, and where their headaches are. They have taken that knowledge and combined it with the Query Store, a feature introduced in SQL Server 2016, which tracks query execution plans and runtime statistics. This allows the database engine to identify queries that have regressed in performance, and changed execution plans (the path the engine takes to get the query's data). If the engine determines that a change in plan has occurred, and the query has regressed in performance, the engine will revert to a previous plan. If it is 3 a. In the morning, Automatic Plan Correction helps mitigate performance issues due to plan regression scenarios without manual intervention, said Joe Sack, principle program manager at Microsoft. Then when you come in that next morning you can look at see what happened and work on root cause analysis. There a number of other optimizations in space in SQL Server 2017, focused on making problematic query operations go faster. Graph Database: One of my favorite features is the introduction of a graph engine into SQL Server. Graph databases are commonly used to track relationships or hierarchies, a place where relational databases have struggled in terms of structure and performance. Graph databases are implemented via nodes (or vertices) and edges (or relationships). For example, you might say John is friends with Jane, and Jane is friends with Becky. While there have been a number of small graph database projects, many have not supported the SQL language, and integration with other systems. By bringing graph into SQL Server 2017, users can take advantage of native SQL, along with the new match operator to perform graph queries. Resumable Online Index Rebuild: As someone who has been a database administrator for way too long, this feature has tremendous appeal to me. Indexes get fragmented as updates and deletes happen, and need to be reorganized and rebuilt periodically. Performing these operations are very IO intensive, and are commonly run during maintenance windows. However on larger systems some operations may run beyond the window and have to be aborted, or more frequently, simply aren't run. Resumable index rebuild allows you to schedule fixed window for your maintenance operations (for example, allocating three hours a night to index maintenance); or simply pause and resume them manually. This feature will change the ways DBAs perform database maintenance. Everything Else: Some of the other features included in this release are improved performance for backups, more enhancements to the In-Memory OLTP feature and integration of the popular Power Query tool with SQL Server Analysis Services. Microsoft also released a very interesting enhancement to its advanced analytics features by adding a predict operator to the T-SQL programming area. This can be a very fast way to perform analysis on a pre-existing R or Python model. SQL Server 2017 is the biggest leap forward in the Microsoft data platform history with real-time operational analytics, rich visualizations on mobile devices, built-in advanced analytics, new advanced security technology, and new hybrid cloud scenarios. SQL Server Enterprise delivers comprehensive datacenter capabilities for mission-critical database, business intelligence, and advanced analytics workloads. § Operating system max cores and memory. § Enhanced in-memory OLTP performance. § Enhanced AlwaysOn with no domain join. § Enhanced SQL Server auditing. § PolyBase in scale-out configuration (head and compute nodes). § License rights to (the APS) MPP appliance. · End-to-end mobile BI on all major platforms. · Web portal experience (all reports in one place). · Pin reports to Power BI. · In database advanced analytics. · R integration with massive parallel processing for performance and scale. · Works with in-memory technology. · Run in database or standalone. · Connectivity to R Open. · Enhanced backup to Azure. · Enhanced HA and DR with Azure ease of use, no domain join (Windows Server 2016). · SSIS integration with Azure Data Factory and Azure SQL Data Warehouse. SQL Server Standard provides core data management and business intelligence capabilities for non-critical workloads with minimal IT resources. · 24 cores max and 128 GB max memory. · 2-node single database failover (non-readable secondary). · PolyBase (compute node only). · Basic tabular (16GB memory per instance). SQL Server Express is a free edition of SQL Server ideal for development and production for desktop, web and small server applications. · 1 GB memory, max 10 GB memory. · Basic reporting and analytics. SQL Server Developer is now a free edition providing the full feature set of SQL Server Enterprise. For development and test only, and not for production environments or use with production data. The following requirements apply to all SQL Server 2017 installations. O SQL Server 2016 require. NET Framework 4.6 for the Database Engine, Master Data Services, or Replication. SQL Server 2017 setup automatically installs. You can also manually install. NET Framework 4.6 (Web Installer) for Windows. · Windows 8.1, Windows Server 2012 R2 and Windows Server 2012 R2. O Require KB2919355 before installing. · Supported operating systems for SQL Server 2017 have built-in network software. O Note: Shared memory and VIA are not supported on failover clusters. § Also note that the VIA protocol is deprecated. This feature will be removed in a future version of Microsoft SQL Server. Avoid using this feature in new development work, and plan to modify applications that currently use this feature. O SQL Server 2017 requires a minimum of 6 GB of available hard-disk space. § Disk space requirements will vary with the SQL Server 2017 components you install. O A DVD drive, as appropriate, is required for installation from disc. O SQL Server 2017 requires Super-VGA (800x600) or higher resolution monitor. The following memory and processor requirements apply to all editions of SQL Server 2017. O At least 4 GB and should be increased as database size increases to ensure optimal performance. O Minimum: x64 Processor: 1.4 GHz. O 2.0 GHz or faster. O x64 Processor: AMD Opteron, AMD Athlon 64, Intel Xeon with Intel EM64T support, Intel Pentium IV with EM64T support. · Installation of SQL Server 2017 is supported on x64 processors only. It is no longer supported on x86 processors. · The software comes with retail Core License, making them good in a production setup. · If you have any question, please dont hesitate to ask. As you install SQL Server 2017, it is important to note that both SQL Server Management Studio and SQL Server Reporting Services are now separate installs from the database engine and other components. Management Studio has a different release cycle from SQL Server and is updated monthly. 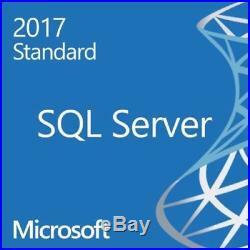 The item "Microsoft SQL Server 2017 Standard No CALs Required 32 Core License" is in sale since Friday, March 22, 2019. This item is in the category "Computers/Tablets & Networking\Software\Servers, Development & DBMS". The seller is "plvcarneiro6" and is located in Miami.